Elizabeth Ann has always lived with her Great-aunt Harriet and Harriet’s daughter, Frances. Aunt Harriet and Aunt Frances coddle Elizabeth Ann, doing practically everything for her and keeping her sheltered from the outside world. Aunt Frances especially prides herself on how well she understands the little girl, and she makes a point of fussing over every little thing that happens to her. When Aunt Harriet falls ill, however, the two aunts must move for the sake of her health, and they cannot take Elizabeth Ann along with them. Instead, Elizabeth Ann goes to stay with Aunt Abigail and Uncle Henry Putney, and their daughter Ann - cousins about whom she has heard nothing but terrible things. As she settles into life on their farm, however, Elizabeth Ann - now known as Betsy - realizes how much she can do on her own and learns to truly understand herself. This lovely gem of a book is one of the best discoveries I have made through my Old School Sunday feature. Originally published in 1916, it is one of the oldest books I’ve reviewed, and yet, I relate to it much more strongly than many newer titles I have read. I loved everything about the story - the characters, the description, the structure, and the message. I was so impressed by the way each chapter built on the one before it to show Betsy’s growth from weak, dependent, and overprotected, to strong, confident, and self-reliant. I enjoyed how she changed in phases - first, she barely knows how to contribute to the household; then, a while later, she is able to imitate her cousin Ann’s actions and solve problems by her example. Finally, Betsy becomes experienced enough to make her own decisions and to look after a younger child herself. The reader can clearly follow this progression because each chapter so clearly illustrates a milestone in Betsy’s life. The story follows such a logical outline that it almost reads like a how-to manual for helping a child come into her own. 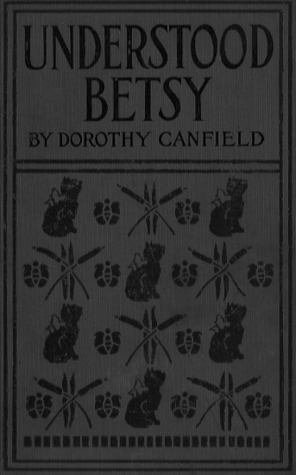 Dorothy Canfield Fisher was a proponent of progressive education and her friendship with Maria Montessori led to her adoption of her philosophies, and her publication of several books that helped bring the Montessori method to the United States.1 The underlying message of this story reflects these beliefs and methods to the point that at least one Goodreads reviewer has joked that the story is “totally some kind of Montessori school propaganda.” Indeed, this book is essentially a tribute to the virtues to be gained from a Montessori education, and I think it is as useful to adults as it is motivational and inspiring to children. At times, it might seem that this theme takes over the story and becomes its sole focus, but it never bothered me or came across as preachy, perhaps because Elizabeth Ann’s transformation is such a powerful example of the Montessori method in action. Understood Betsy, though approaching its one hundredth birthday, still feels fresh and relevant today, and I think many contemporary kids, especially those who have not been given much freedom to explore the world for themselves, will relate to Betsy’s trepidation about her new surroundings as well as her willingness, over time, to try new things. This is the ultimate child-centered story, and I think every kid - male or female - can benefit from reading it. I know it is a new favorite for me, and a book I will probably return to in the future, especially when my own child is old enough to appreciate it. 1. Bragg, Lois. "Dorothy (Frances) Canfield Fisher." American Novelists, 1910-1945. Ed. James J. Martine. Detroit: Gale Research, 1981. Dictionary of Literary Biography Vol. 9. Literature Resource Center. Web. 18 Nov. 2013. One of my favorites as well! Sometimes I wonder if my childhood public library had anything published after 1950, based on the books I read!